The Solar Water Heating page discusses the system installed. The area of a house that consumes the most water is showers, which typically account for over a quarter of the average home’s use1. To reduce that volume as much as possible we’ve installed low-flow Kiri showerheads from Methven, which use Methven’s Satinjet technology to ensure great showers with less water. They use 5 litres of water per minute, around 40% less than average2. Other products in the house that reduce water demand are dual flush toilets, low-flow taps, and the washing machine. We paid attention to the Water Efficiency Labelling Scheme (WELS) rating of each product when deciding what to use in the house, which allowed us to easily see how much water we could expect each product to consume. Any use of hot water in a home requires energy to heat that water. For example, the energy used during a hot shower can be the equivalent of running an oven for well over an hour. The average Auckland household spends around $600 of its annual energy bill on water heating, and the bulk of hot water is used in showers. So an efficient showerhead like Methven’s low-flow Kiri not only saves water – it also reduces the energy required to heat water. Because the Kiri is using 40% less water it’s also using 40% less hot water, meaning 40% less water heating. The average Auckland household spends around $600 of its annual energy bill on water heating, and the bulk of hot water is used in showers. In addition to the water savings, using showerheads like the low-flow Kiri could save us another couple of hundred dollars in energy bills each year. 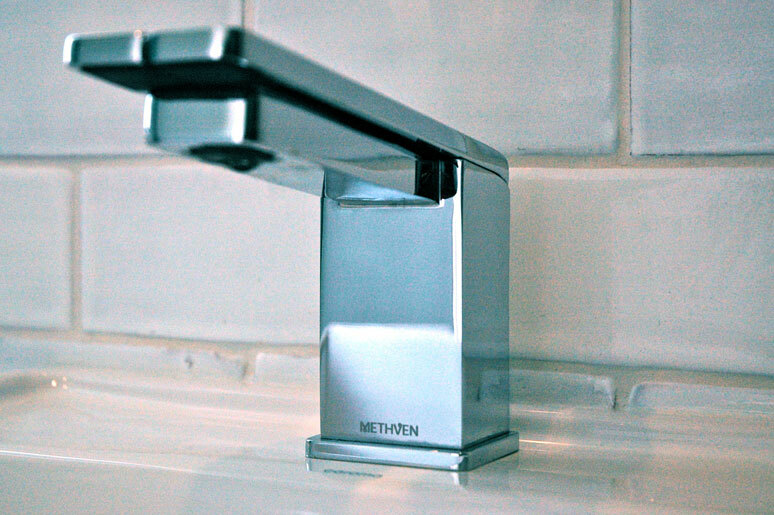 Another Methven product that saves energy are the Tahi taps we’ve installed throughout the home. They have a twin-lever mixing mechanism that separates the control of hot and cold water, meaning hot water is only demanded when it is needed. This results in less hot water and, again, less energy used. Water efficient products that reduce hot water heating have another benefit. Because we’re heating our water using solar hotwater panels, the lower the volume of hot water required, the smaller the solar hot water system can be. The low-flow Kiri showerhead from Methven uses around 40% less water (and energy) than average. Tahi thermostatic single flow mixer from Methven. Methven’s Tahi taps, with twin-lever mechanism. The twin-lever mechanism controls hot and cold water separately, reducing hot water demand. The low-flow Kiri showerhead uses Methven’s SatinJet technology, providing a great shower with less water. We've used low-flow taps and showerheads from Methven throughout the house. These are essential to achieving our water efficiency goals and, because showers use hot water, they also reduce our energy demand for water heating. The Kiri showerheads, for example, can cut the volume of hot water used in showers by 40%. Building Research Association New Zealand (BRANZ). (2008). Auckland Water Use Study - Monitoring of Residential Water End Uses. Calculation based on data in table 4, p6. Build Magazine. February/March 2009. Getting a handle on water use in Auckland homes. p66.